Probably everyone has heard about seeing the mysterious Big Five. 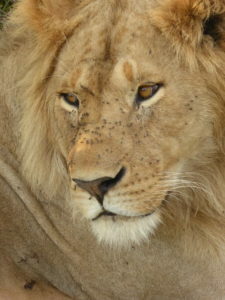 Something no Africa-traveller should miss, if they want to call their safari an “awesome experience”. We can assure you: even without completing this list of animals, you will create moments you will never forget. But who are the famous Big Five? Contrary to your expectations they are not the “biggest” or tallest animals of Africa, otherwise the giraffe must be in the first place. No, the “Big Five” are an old ranking of animals difficult and dangerous to hunt for big game hunters. Because of their aggressivity and fighting spirit, trophies of these animals are a “great reward” and sign of braveness for these people. Luckily most of todays “hunters” are “aiming” with cameras, binoculars and just want to enjoy spending time with all wild animals of Africa. But even nowadays many people are still hunting the “Big Five” just for the fun of doing so. Where to see: Here in Kenya you have a very high chance of seeing the Big Five. But of course no one can and will give you a guarantee. It’s real wildlife and not the zoo next door, but if you take enough time and visit the right places, you have a great opportunity. 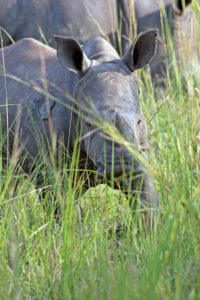 These two different species of Rhino living in Africa are the most endangered of the Big Five. Poachers aim for their horns to sell them on the asian market where they bring around 60.000 Dollars. Per Kilo. An incredible amount of money for a horn that’s made out of ceratin, the same product our hair and nails are made of. But nevertheless, many people in Asia believe in the medical effect these horns have, e.g. curing cancer, reducing fever and cramps and even helping with erectile problems. Nothing that has ever been proven by science. private institutions. With visiting National Parks, not buying anything made of endangered species or donating to the right institutions, you can support the survival of one of the “oldest” animals walking on earth. One funny fact at the end: Do you know why we speak of the black and white rhino? If you look at them, they both seem to be grey-ish, right? Don’t worry, you don’t have to meet the doctors, your eyes work quite well. It was a great misunderstanding that led to the rhinos’ names. The “white” rhino has a “wide” mouth, the black rhino, a pointed one. When talking about the “wide” (mouthed) rhino, someone understood “white”, and as a consequence, named the other subspecies “black rhino”. With up to 6 tons of weight, the African Elephant is the biggest animal walking on earth. Even if you probably see many of them during your safari, their numbers are decreasing dramatically because of ivory poaching. The Great Elephant Census 2014 showed that Africa’s elephant population dropped by around 30% – in just 7 years. An alarming decline, since elephants are a keystone species. This means that they build, transform and develop nature and landscapes with their behavior. They cut down trees to keep the savannah a savannah. Their dung is full of seeds of the plants they feed on, so they are the natural gardeners of Africa. 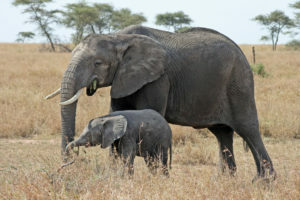 Elephants have a very complex social life with an old matriarch being the leader of a family. They help each other if there is a problem, they mourn their dead relatives and every loss is a very traumatic cut for the family. Elephants can solve complex problems with using tools or just “think” about a solution. They can destroy fences with the help of trees or stones, in order to let their youngest pass. So next time you meet this member of the Big Five from eye-to-eye just remember: elephants are probably as intelligent and definitely as compassionate as we claim it for ourselves. The biggest bovine animal of Africa can weigh up to nearly a ton and is assumed to be one of the most dangerous animals of the continent. Together with the hippo they cause most of the deaths among the african people. Especially lonesome males can get really dangerous when you meet them in the wrong moment. Male and female are easy to distinguish since the bulls are taller and their horns, the special feature of buffalos, are growing together on their heads. They form something like a helmet, which you can’t find with cows. 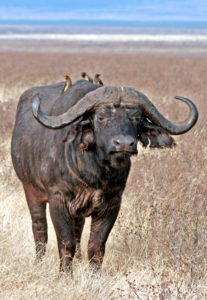 Groups of buffalos are always accompanied by little birds, the ox-pecker. These two species form the perfect symbiosis, the bird gets food, the buffalo is staying healthy without parasites and the small birds are a natural alarm, when danger is approaching. 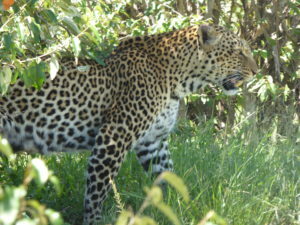 To find this beautiful cat on your safari will be your biggest challenge. Seeing a leopard is a matter of luck: it’s about being at the right spot at the right time. Leopards are solitary cats and they prefer being active during the night. When the sun is burning down on Africas savannah this cat loves to hang around well hidden in bushes or on trees. You will rarely see them in the open grassland during daylight, what makes them hard to find. Many people confuse the leopard with the cheetah, but their fur is quite different. The leopard’s fur is painted with rosettes, the cheetah’s with smaller black dots. The leopard has shorter legs and seems to be “more compact” than the cheetah, who has long legs in order to reach their unbelievable high speed. Leopards communicate with each other with the help of white spots on the back of their ears and their tails. These signs are visible even at long distances in the high grass. If you are lucky to see the leopard, just enjoy this very special moment. It is something that’s not happening to everyone! In our next blog post, you can learn about other “Fives”, there are several more. Or do you know the “small”, “ugly” or “shy” Five? !